The United Nations Office on Drugs and Crime, Regional Office for Southern Africa (UNODC ROSAF) amongst others supports the work of Lifeline/Childline Namibia. Together, they are working for the optimization of a 24-hour, toll-free hotline for victims of gender-based violence (GBV). The newly acquired equipment is expected to help improve and expand data collection processes, improve the availability of data on gender-based violence to inform effective programming, strengthen the referral mechanisms, track cases and identify gaps in quality service delivery. The newly optimized database was launched on 2 August 2018. Distinguished guests attended the event: UNODC ROSAF Representative Zhuldyz Akisheva, Namibian Minister of Gender Equality and Child Welfare Doreen Sioka, Deputy Commissioner Situde of NAMPOL, UNICEF Country Representative Rachel Odede as well as several other key members of Lifeline/Childline Namibia. Helplines are a trusted place of support for millions of gender-based violence victims across the world, as it can provide help and support services for survivors, fulfilling the fundamental right to be heard and treated with dignity. In Namibia, most cases of gender-based violence go unreported because of stigmatization. The toll-free helpline serves as first point of contact with GBV services and is the most trusted and accessible gateway for GBV victims to find help. 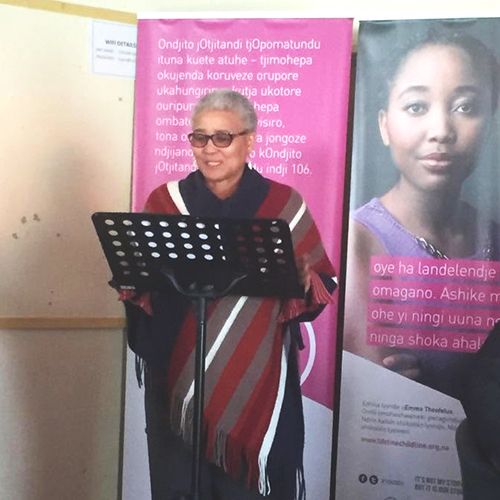 It is expected that the Namibian helpline will act as a referral mechanism; guide victims through the system; detect and fill gaps in service delivery and support policy making with data on survivors' needs. 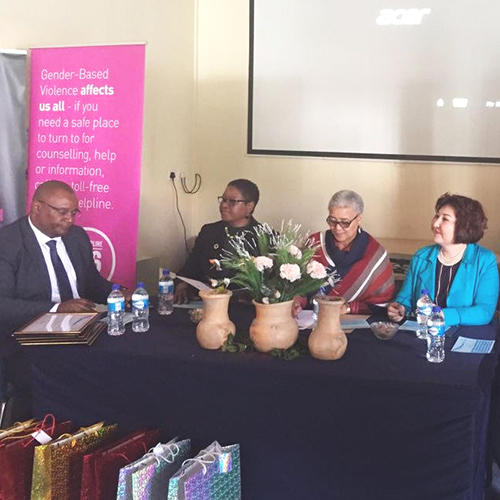 It is further hoped that the national helpline will strengthen the professional network and collaboration among partners of different sectors, as they will advance their cooperation, collaboration and referral pathways, and thereby ultimately act in the best interests of all GBV survivors in Namibia. The attendance of significant representatives of other sectors highlighted both their commitment to and their support for the helpline. This is just one example of many activities of UNODC in Southern Africa. The Austrian Development Agency is funding these engagements with 1 Million Euro. Reducing gender-based violence, stopping crime and supporting good governance are common goals.